A tale of Catherine Cookson-esque tragedy and Northern grit, Pauline Prescott's life story will shock and amaze. 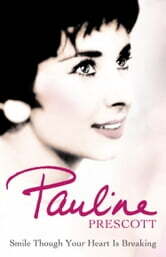 A mother and a faithful friend, Pauline is not your typical politician's wife. She is immensely proud of her role as a housewife and over the near-forty years she has been in the public eye she has remained discreet, dignified and deeply loyal. The daughter of a bricklayer, who died when she was young, Pauline came from humble backgrounds. At 15 she found herself pregnant by a married US serviceman. Resisting all attempts to give her son up for adoption, she struggled on for three years, until she was finally persuaded it was for his own good. She never expected to see him again. She trained as a hairdresser and got a good job at a salon in Chester. Soon afterwards she met John, a dashing waiter who whisked her off her feet and married her. John's dreams of becoming a union activist meant that he spent the next eight years in university. It was Pauline's wages that paid for everything. She never complained. John quickly rose through the ranks and suddenly, it seemed, he was the Deputy Prime Minister. Pauline went almost overnight from a Hull hairdresser to a key participant at political events. Always immaculate, she quickly became known for her fashion, style and stunning hats. But Pauline's world was turned upside down when, more than forty years after she put her son up for adoption, John received a call to say the press had tracked him down. The decision to give up her son had been heart-rending. All these years later, Pauline was overjoyed to be reunited with the child she had pined for for so long, finally getting the happy ending she had dreamed of for years. Throughout John's career, Pauline has had to cope with the lack of privacy his position has afforded their family. Through it all she has emerged a figure of admiration. Loyal, sharp, good humoured and articulate, Pauline has entranced the nation. Now tells us her story in her own words. Warm, moving and at times painfully sad, Pauline's autobiography is an honest account of a fascinating life.